Measurement example archives | SEIKA Digital Image Corporation. 西華デジタルイメージ > SEIKA Digital Image Corporation. > Measurement > PIV ( Particle Image Velocimetry ) | Overview & Principle > Measurement example archives. 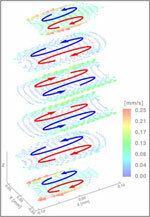 we introduce PIV measurement examples introduced at past web site of Seika Digital Image. Large Scale PIV　"Measurement of 2.5 m × 1.5 m area with stereo PIV"
We measured the flow around the cube simulating the building in the large boundary layer wind tunnel by stereo PIV. By combining the latest high-performance camera and analysis algorithm, it is possible to measure 2.5 m × 1.5 m area with high spatial resolution of 5 mm / vector with high accuracy. By using a 120 mJ double pulse laser as the light source and placing two cameras at the forward scattering receiving position, it is possible to measure a wide area even with a comparatively low output light source. We used high resolution high sensitivity double shutter type pco.4000-PIV.The specification of this camera is resolution 4008 × 2672 pixels, gradation 14bit monochrome, cooling is ⊿ - 45 degrees. 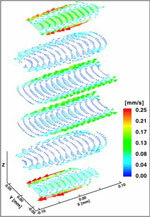 Image deformation correlation, multi grid correlation, central difference method, double correlation we are used together.With multigrid correlation, high resolution can be achieved by reducing the interrogation window while keeping the amount of movement of particles between the two time adequate.It is possible to improve S / N ratio by double correlation and improve secondary accuracy by the central difference method.Furthermore, by applying image deformation (image deformation of subpixel), highly accurate analysis without peak locking becomes possible. It is the most important technique in large scale PIV in large wind tunnel.The seeding generator used PivPart45.This generator can atomize DEHS (or DOS) oil with Rasukin nozzle and generate a large amount of particles of about 2 μm in particle size.DEHS is harmless, but if the particle size is 1 μm or less, it will reach the back of the lung when inspired.On the other hand, it is said that if it is 2 μm or more, it comes into contact with the wall near the bronchial tube and does not reach deeply.Considering the impact on the human body, I think that the size of about 2 μm is good. As is common in PIV, how to spread seeding particles evenly is an important point.Global seeding (Scatter it throughout the wind path) is the best way to diffuse uniformly.If the seeding is continued to be sprayed from the downstream position of the measurement section of the wind tunnel, the whole wind path will be filled with seeding.For PivPart45 it will be ready for measurement in a few minutes even in a large wind tunnel.In this method, however, it is better to avoid as much as possible considering the impact on the wind tunnel because it will cause a large amount of seeding particles to flow back into the wind path for a long time.So we use seeding spray porous nozzle called seeding lake.Seeding Lake is a collection of multiple tubules with pores opened.It is possible to achieve uniform seeding without influencing the flow by installing and spraying immediately after the rectification cavern, and it can do with the minimum amount of seeding necessary. 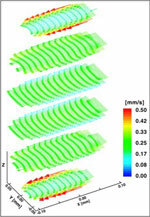 Large scale PIV　"High resolution measurement of thermal convection"
Images of photographs can hardly resolve individual particles, but by utilizing the high-performance analysis algorithm installed in Koncerto, highly accurate analysis without peak locking even when measuring such a wide area Is possible.Smoothing filter etc… are not used. 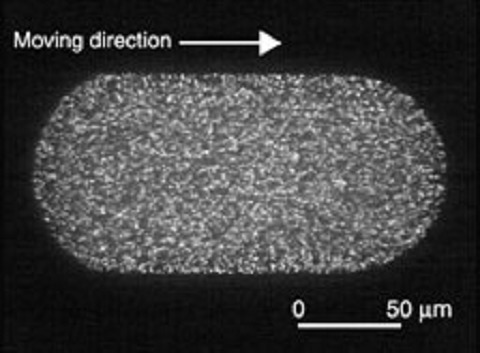 Micro PIV　"Droplet internal flow that moves in microchannel"
The capsule-like micro droplet moving inside the microchannel with a width of 100 μm and a depth of 100 μm was divided into six sections and precise measurement was performed.Inside the droplet, it turned out that three-dimensional and complicated internal flow has occurred due to the influence of the wall surface of the microchannel.The confocal scanning micro PIV system enabled this measurement. 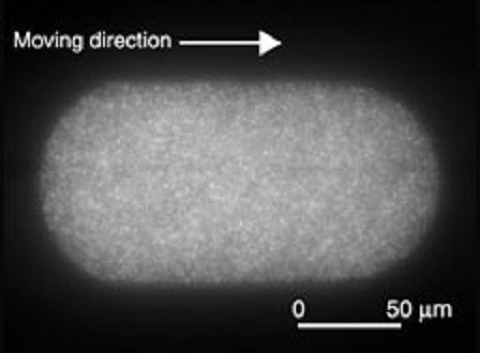 Regular fluorescence microscopy images, regardless of how much the depth of focus is reduced by using a high-performance objective lens, scattered light from the particles around the focal plane will appear and the background will brighten. If confocal scanner is used, in principle, scattered light from particles around the focal plane is blocked, and a clear particle image with high contrast can be obtained. The part in contact with the wall is dragged by the wall and the speed is slow.You can see that it is faster than the traveling speed of the droplet at the corner where it is not in contact with the wall so as to compensate for the slowed speed. In this state, the speed of droplet movement is included in all speed vectors. 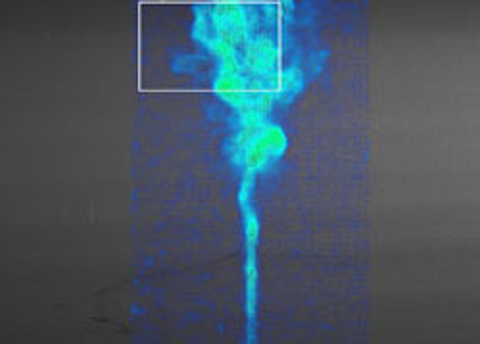 It is possible to obtain the velocity distribution of the internal flow by subtracting the moving speed of the droplet. Due to the influence of the wall surface, a three-dimensional and complicated circulating flow is formed inside the droplet. Time series PIV　"simultaneous measurement of speed pressure"
Time series PIV　"Flow of prisms"
This sample movie is about the wake of the prism. It is a sample movie of time series stereo 3D-PIV.